Long Beach is a small city of 1,400 residents on the Long Beach Peninsula in southwestern Washington. It is a part of Pacific County and, naturally, is noted for its scenic, unspoiled beaches on the Pacific Ocean. One of the most popular pastimes here in Long Beach has always been digging for razor clams; there is even an annual festival dedicated to them! The city remains close to its roots, but offers many modern-day activities as well, from biking and surfing to horseback riding on the beach. 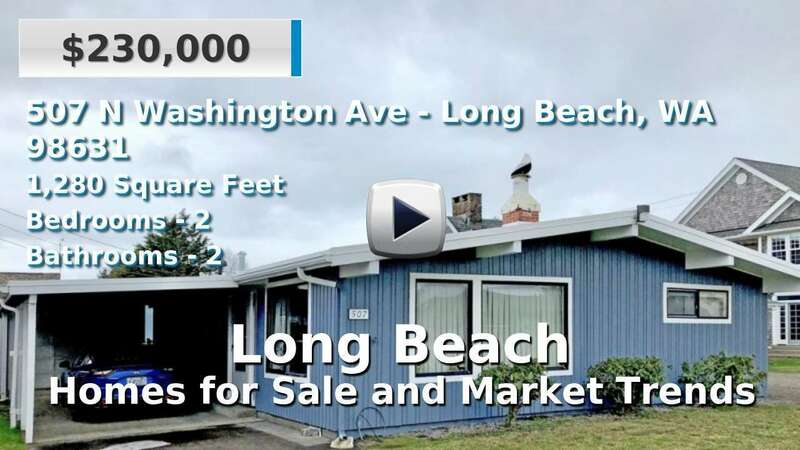 Homes and condominiums for sale in Long Beach are about the same as the county and state average age. The nearest large cities are Raymond, Longview and Centralia/Chehalis, all within about a 2-hour radius from Long Beach. 2 Beds | 1.75 Baths | 1070 sq. Ft.
2 Beds | 0.75 Baths | 1008 sq. Ft.
1 Beds | 2 Baths | 682 sq. Ft.
3 Beds | 2.75 Baths | 1999 sq. Ft.
3 Beds | 1.75 Baths | 840 sq. Ft.
4 Beds | 3.25 Baths | 3580 sq. Ft.
2 Beds | 1.75 Baths | 981 sq. Ft.
2 Beds | 1.75 Baths | 998 sq. Ft.
| 1 Baths | 391 sq. Ft.
3 Beds | 1.75 Baths | 2080 sq. Ft.
5 Beds | 4.25 Baths | 3442 sq. Ft.
2 Beds | 858 sq. Ft.
3 Beds | 2 Baths | 2000 sq. Ft.
4 Beds | 3 Baths | 2433 sq. Ft.